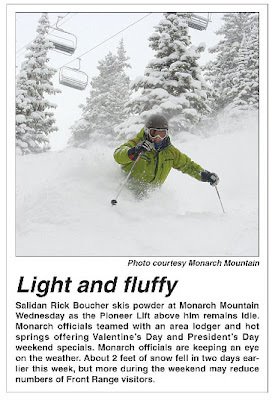 Cool picture of me appeared in The Mountain Mail yesterday. The powder has been awesome at Monarch . Eric Ramsey has been taking pictures and I’m very happy to go along. This one ended up on 9 News and in the local paper. I think he likes how I can ski right at him without hitting him and the plastic things on my fingers that define my gloves. Actually this wasn’t better powder than yesterday. This picture was taken about four days ago. The powder has been getting better and better everyday! It’s hard to teach lessons on the beginner hill when there is so much great powder on the mountain. But it’s all good. Those of us who have been around awhile know where the great powder stashes are even after the 9 am crowd mashes up the hill. The tree skiiing is gettin’ really good these days at Monarch. I’ll tell you about the Mirage trees and the Zipper cliffs, but if you really want to know where the great stashes are you’ll just have to try and keep up. Then there’s the Cat Skiing and Mirkwood. Mirkwood is really great if you can get a ride up. I’m getting lazy these days where I don’t like to hike so much when the powder is so awesome inbounds. Look me up. I’ll show you where to go.